. . . EDUCATION FOR PEACE . . .
During the National Educational Forum 2017 held in the capital of the country and encouraged by Unesco and the Ministry of Education, Norte de Santander was present this year with two proposals which were among the 12 best being recognized by the two organizing entities. One of the proposals presented was that of the Cristo Obrero Educational Institution, located in the neighborhood of La Ermita de Cúcuta, who undertook a project called ‘School reconciliation, commitment of all for a culture of peace’ by which they promote healthy coexistence in the institution. In total, 600 strategies were presented throughout Colombia, with initiatives focused on the search for a Colombia without conflicts. The presentations included topics such as reconciliation, democracy, reconstruction of historical memory, society, violence and human rights. Peace Studies in School Curricula, What would it take to make it happen around the world? What is happening in Colombia, Is peace possible? Ángel Ramiro Peñaranda, a teacher at the Cristo Obrero School who leads the Cucuteño project, indicated that this curriculum for peace “did not exist before.” It contains subject plans, parcelers and class preparers. “I never thought that this could be an experience for the Ministry, but with the support of the rector of the school, it was presented in the forum,” the teacher told a media outlet in the city of Cúcuta. The other educational center that represented the northern department of Santander was the La Salle School in Ocaña, with the demonstration of a pedagogical strategy to promote peace within the campus. The institution participated with the ‘Project of democracy, culture, peaceful experience and youth’. “The project includes three lines of work. The student representative is responsible for raising awareness of the fulfillment of duties and promotion of rights by all students, leading to the adoption of a school peace manifesto,” he added. 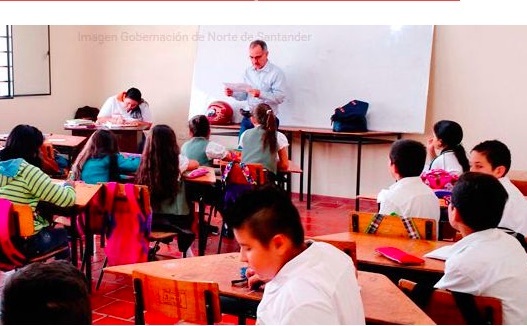 He added, “this new achievement of the institution is a pride for Norte de Santander, because we can make it known not only to Colombia, but to the whole world, because teachers strengthen the construction of peace in our country through what we do pedagogically “. The two institutions are part of the 40 that make up the Nortesantandereana Network for a School without Violence that works day by day for better coexistence and relationships among citizens.